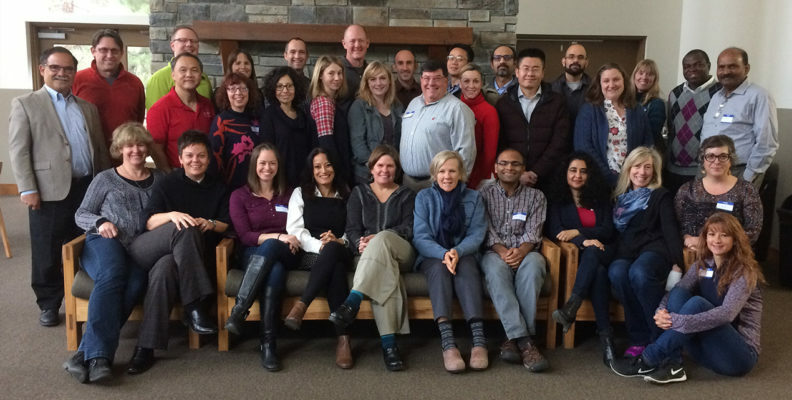 The seventh cohort of the Provost’s Leadership Academy kicked off with a retreat at Ross Point in the fall of 2017. What is the Provost’s Leadership Academy? The PLA is an opportunity for Deans and Chancellors to recognize early and mid-career faculty who show promise as leaders and positive role models in their colleges or campuses. The PLA provides these faculty with a semester long training program that develops self-awareness, confidence and leadership skills, expands their network within the University, brings them in touch with University leaders and builds knowledge of the University and its challenges. Participants will experience a top quality program led by skilled leadership training professionals and knowledgeable University administrators. Program activities are delivered in highly interactive, engagement-based online and face to face sessions. Participants will increase self-awareness, develop an understanding of values based leadership, improve conflict resolution skills and build their professional network. The program begins with a mandatory 1.5 day retreat at Ross Point in Post Falls, ID, in October followed by 5 face-to-face sessions over the course of the Fall and Spring semesters (3 related to leadership activities and 2 related to University function). The face-to-face sessions are interspersed with three online modules which introduce important leadership topics and allow participants to engage in related experiential activities to practice skill development with peer mentors. Activities are designed to support participants with executing a leadership project that they design specifically for this program (see below). Attendance and active engagement in the face-to-face sessions are essential for success. During the semester each participant is required to work on a project that involves the practice of leadership. The project must involve influencing others to achieve a goal. Deans, Chancellors, or Department Chairs assign the leadership project. The project should be one that is meaningful to the participant’s unit. Therefore, it is important that participants develop the project in consultation with unit leaders at the time of nomination. Past projects have included negotiating strategic plans, developing and getting approval for new academic programs, spearheading new policies and procedures for evaluating graduate students, developing review processes for clinical faculty, and reorganizing a department. The Office of the Provost covers expenses for the retreat, online instruction and face-to-face sessions. Who should participate in PLA? Candidates must be faculty, either tenured/tenure track or clinical. It is recommended that the participants have at least three years at WSU and no more than a few years beyond promotion to associate professor rank. The purpose of the program is to recognize and build the next generation of university leaders. A nomination to the PLA is not a guarantee or promise of promotion, but recognition of potential. Please contact the Provost’s Office at (509) 335-5581 and ask for Kristina Peterson-Wilson.